Now, let me send you this issue a day in advance, as I'm traveling non-stop for the following days, until I arrive at my home on Thursday, and I cannot guarantee good Internet connection tomorrow evening. I also wish to let you know that I started to add (little by little) my traveling experiences to this website. You can start catching up with me on Global Networking , as long as you accept that the pages are still a work in progress and that I shall add and change content, as I go along. It's all part of the creative writing effort and I have way less time for this than I anticipated before starting. I hope you enjoy reading and I look forward to receiving your comments in the dialogue boxes at the end of each page. We are now starting to practise the lessons from our past e-zines. I'm going to prepare a separate page on this website for each concept, and include some exercises for you to practice with. The only problem today, is that I'm sending this issue prematurely, so I didn't have the time to write the exercise. However, I shall try to add it tomorrow, if I have Internet access in Oslo. Today we shall deal with Frequency Adverbs - I hope you find it useful. We talked about Blog It! before last time, when we looked into Form Build It! (FBI!). Today we turn to e-zines, which are another form of establishing good relationships with your readers. It all starts with content. The goal of your newsletter is to deepen the P in C T P M. Build likeability and trust. Nurture a great relationship with customers and prospects. There is no better way to keep in touch with your customers (current and potential) on a regular basis. As a service provider, your e-zine must contain excellent content! If you are a service provider, an e-zine is a must. The better your e-zine, the more you impress people with your expertise and ability to deliver. Solid content is always important, of course. But if you are selling a service online, it's absolutely critical. Yes, in order to get the MWR (Most Wanted Response), you do first have to give great content. "Give, then get." Always tie e-zine content back to your MWR with a call to action. Be "gentle." Be creative. But don't be shy. Provide excellent content, then ask. Also, do not be shy about doing some "selling" to get the M. Each issue should directly increase your chances of getting your MWR. As long as you "take" with class and subtlety, your reader/prospect won't object. If he does object, he will never be a customer. When you’re ready to build your zine with the SBI system, there is an online help facility called MailOut Manager, to get you started. Also, the e-zine forum is another source of ideas, tips and advice. This is as deep as we can afford to go into this topic right now, and next time we shall look into building a personal social network with influencers in your niche. Right my friends, the first game I found for you was really difficult, so I tried for another one & here it is: the Buzzing Bees game, just for the fun of it. If you find it too easy, let your children have a go and just supervise that they know the meaning of each word. It comes from the Cambridge University Press website, where it is classed as a level 2 game, that is beginner's level, almost pre-intermediate. 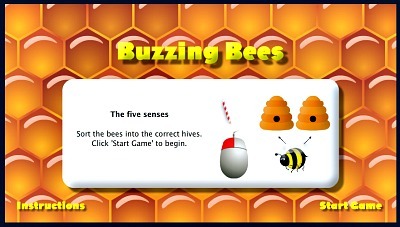 This is a vocabulary game in which you will have to separate two groups of words that keep flying around on the screen into two beehives – one for ‘senses’ on the left and another one for ‘parts of body’ on the right. 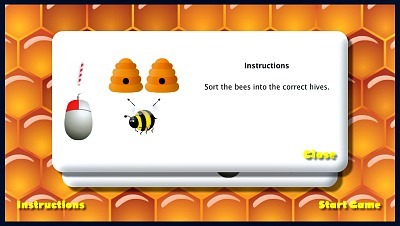 So, you’ll see the bees flying around, carrying some flashcards with the words on them and you need to use the computer mouse to ‘shoot’ the bee RIGHT in front of the correct hive, for it to go in and lodge the word. 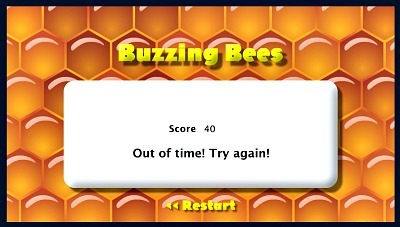 OK, you do have 2min 40seconds to finish lodging all the words , but just in case you/your child can’t manage, this is what’s going to happen – you’ll be given your score and you’ll be invited to try again. However, if you do get to the end successfully, you’ll get a great pat on the shoulder, on top of your score.